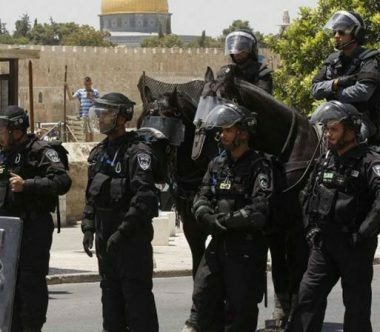 Israeli soldiers abducted, Wednesday, six Palestinian women in front of one of the gates leading to the Al-Aqsa Mosque, in occupied Jerusalem. Media sources said the soldiers abducted Naheda Salah Abu Shaqra, 64, Salsabeel Mohammad Emara, Sajeda Mahameed, Sojoud Mahameed, Samah Mahameed and Nour Mahajna. The army also summoned Khadija Khweiss for interrogated at a nearby police center. It is worth mentioning that Naheda is the sister of Sheikh Raed Salah, the head of the Islamic Movement in the northern part of the country. He was repeatedly abducted and imprisoned by Israel, and is frequently denied access to the Al-Aqsa Mosque. This is the second time Naheda is denied access to the holy site in one month, and was previously one of many women, who received orders forbidding their entry into the mosque.